Coat 2 large (9x5x3 or 8x4x2) loaf pans or 6 mini-loaf pans, with cooking spray. In large bowl, with electric mixer or by hand, cream butter with sugars and vanilla until light and fluffy. In separate bowl, whisk eggs slightly, then add them to butter mixture, combining well. Puree banana with mango in blender or food processor; this video is excellent for how to handle mango! Once mango is cubed, simply add to bananas and puree until smooth and creamy. Combine banana-mango puree well into butter-egg mixture before adding dry ingredients. Sift flour, baking soda, and salt 3 times (this is one of the secrets to this recipe :), then add dry ingredients to batter. Make sure all ingredients are incorporated well; this may be done with the mixer or by hand. Do not overmix, just blend well. Pour batter into prepared pans, dividing batter as evenly as possible. For large loaves, bake for 50-60 minutes, or until loaves test done (toothpick inserted comes out clean). For small loaves, bake for 35-40 minutes. Loaves will be golden brown when done. Allow pans to cool on wire rack for at least 10 minutes before gently turning bread out of them, to enjoy! In my experience, foods that induce bliss are reminders that we live in a kind and benevolent universe. When Mexico’s Champagne mangoes (also known as Ataulfo) begin showing up on produce stands in plentiful amounts, this theory is as good as guaranteed. When these sweet ripe, silky-fleshed mangoes are alchemized with a few dark spotty bananas on one’s counter (or those perhaps deeply blackening in the fridge) ... bliss definitely comes to beautiful life, when baked into pans of quick bread. We grew up baking ripe bananas into bread, sometimes adding chocolate chips and/or walnuts; the mere thought of either always makes me smile. I happen to think that banana bread baking is on of the most pleasurable aromas in the world. It is highly recommended that we give ourselves such a sensual gift as often as possible! Combining mango with banana (with lots of butter and eggs ;-) was actually a very secret recipe of mine, until 1996 when I self-published my first and only cookbook, Angel Food, which is now out of print. Until that time, I thought its recipe ought to be kept only for me, and then it occurred to me that more love, more joy, more bliss ... could be shared if more people made it more often. It was named Bliss-Inducing Banana-Mango Bread. 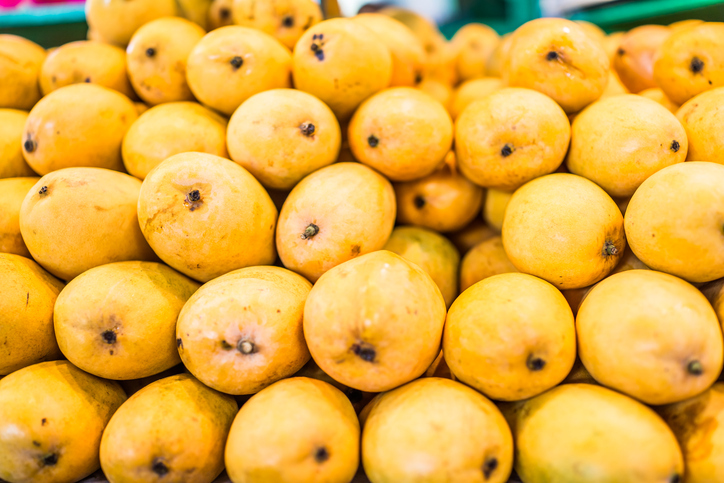 All three produce stores in the Original Farmers Market now have lots of these mangoes available, at about $1 apiece. Their season runs through about August if we’re lucky. Typical Mexican mangoes will also work perfectly, especially since they were the ones I used when I first divined the recipe. One recipe will make two large loaves or six small loaves. The little loaves are so perfect for gift giving or, midnight snacking ;). I will leave you with a funny story about another way to enjoy one small loaf, for which I hope you will never, ever, ever, have to use. About 10 years ago I was on my way to visit one of my loveliest friends for lunch; she lived in Sherman Oaks just off the 405 freeway. I had baked this bread for her and had a small loaf wrapped beautifully for a gift. Just as I approached the freeway exit, traffic came to a screeching halt due to a crane collapsing across the lanes, and no one could move ... for more than 4 hours. Resisting the urge to drink any water for lack of restroom opportunity and feeling as if I’d starve meanwhile, I finally gave up all resistance. I opened her gift package of bread, broke it apart gently by hand, and ate the entire loaf. It was actually, really delicious. Having finally arrived at her home closer to dinnertime, I first apologized profusely for having eaten her gift. She couldn’t have been more gracious and sympathetic, and she took me out to a spectacular lobster dinner! After that, every time we saw each other I made sure I brought her a gift of this banana-mango bread. Here is hoping you will make some for those you love. It makes more than enough to share, and promises to induce bliss each time you do!